Although I write mostly about the Regency period and its fashions and manners, I do find the 18th century’s styles terrifically glamorous. I love the men's ornate clothing, and the immense coiffures the ladies sported are nothing short of astonishing. 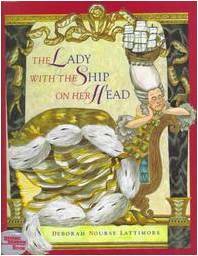 When my daughter was little, I enjoyed the children’s book The Lady With The Ship on Her Head every bit as much as she did. The variations on the 18th century hairstyles are nearly endless; one included a (not so) miniature vegetable stand. Others appear to require not so minor feats of engineering to support the cantilevered structure. 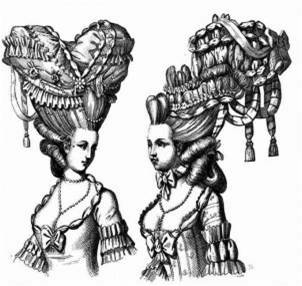 So, when I refer to a remarkable coiffure that is part of an outfit that Allegra, Duchess of Gravesmere is wearing to a social event, nothing I have imagined is as outrageous as some of the historical evidence. The time period when these styles were all the rage was quite brief, running only from about 1770 to 1780.&nbsp; During most of the 18th century, women’s hairstyles, though often powdered, were much simpler in comparison. But, that decade was long enough to provide an iconic image of glamor, absurdity, and even a little surrealism that we can still all enjoy today. Not to mention all that time my daughter and I spent enjoying the book about the ship on the lady’s head. 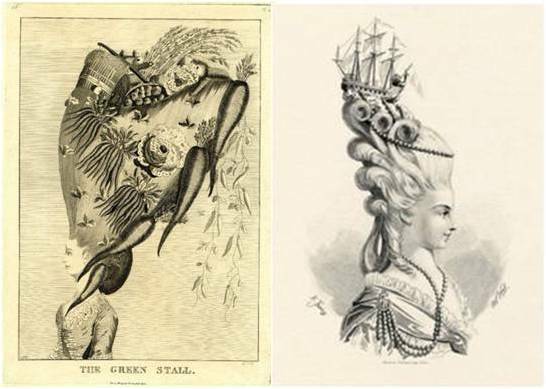 This book isn’t exaggerating about ladies with ships on their heads; here are two 18th century images of ladies with a ship adorning their coiffures. 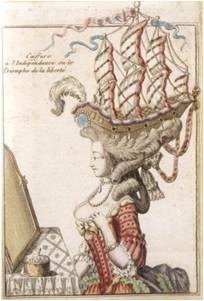 These updo’s on steroids were actually developed in honor of a naval battle of the time; the second picture is Marie Antoinette in a coiffure known as the Fregate de Junon. I try hard not to think too much about what was actually involved in constructing these head born edifices- the various types of puffs, fake hair extensions, supporting structure, adhesives, pomades, powders, and on and on, many of which you wouldn’t care to read a modern Materials Safety Data Sheet on. And of course, there’s the sad reality that women sometimes wore these hairstyles for, ahem, weeks on end. They became populated with well, other living things, lice most frequently; although there are tales of mice living in these hairdos it’s hard to imagine a timid mouse actually occupying one for long.